Recently just acquired a RS200. Converted to a 1JZ, R154 manual trans. New to this ride and engine, although I've experience alot of other marques with different set up before. Am here to acquire knowledges from people around the world. Thanks for the welcome guys. She is not in my garage yet.. I need to clear a space for her. Too many mistresses around Will post up photos once I have her. Just wondering though, the headlights are rather faded and yellowish, are there any aftermarket lights that anyone can recommend, or just sand the original down, polish it and keep the ori look ? 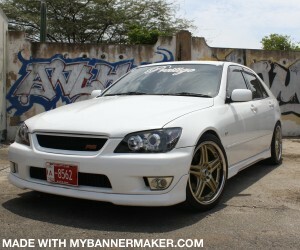 for me, i like the jdm look.. the black face headlights.. its up to your preference..